Whether you are home or on vacation this summer, getting outdoors with your little one is probably one of your favorite activities. From days at the park to nights at barbecues, Erbaviva has some great skincare products for the entire family. No need to pack multiple items for you and your little one - these products are safe enough for sensitive skin while still providing effective protection. So what will you need for your outdoor fun this summer? 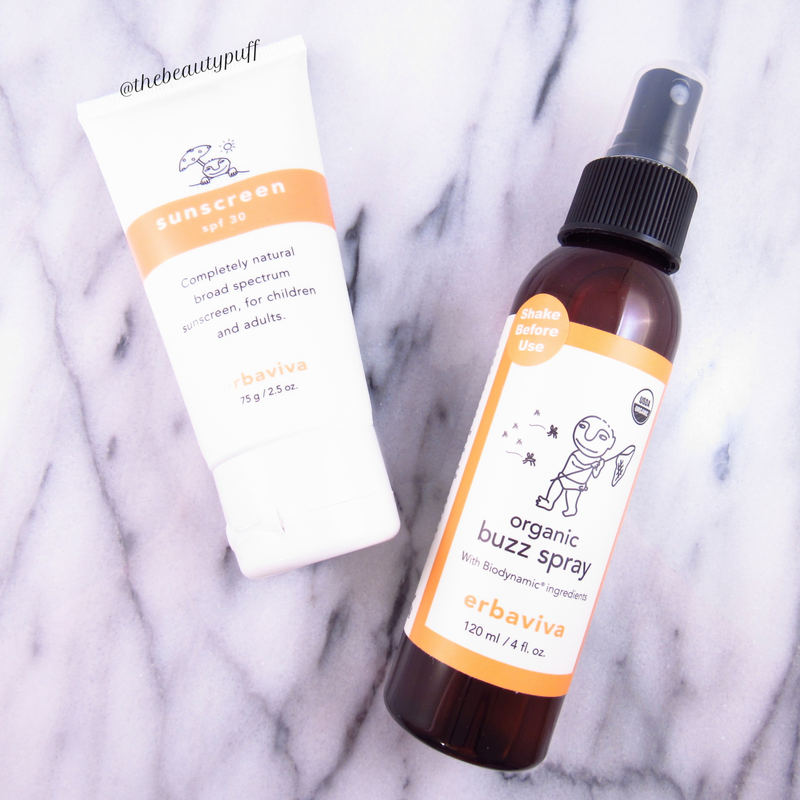 Erbaviva's organic sunscreen with SPF 30 will have you protected during the day and their DEET-free natural Buzz Spray will keep the bugs away at night! Erbaviva's sunscreen is infused with aloe, sunflower, jojoba and olive oils, along with organic essential oils of lavender and chamomile like many of their other products. You can read about some of them here! This formula is lightweight, leaves no residue and is fast absorbing so you can have your little one protected in no time! You can even use it on your face without the need to pack additional face products. This came in really handy when we traveled recently! This undetectable sunscreen is also water resistant up to 80 minutes. I love having barbecues or enjoying the fresh air on summer nights. What I don't like, is bugs. Constantly swatting away pesky mosquitoes and other bugs is not my kind of fun. Typical bug sprays smell and feel horrible. I always want to shower and remove all traces of them before going to bed! On top of that, many bug sprays are filled with chemicals I want no where near my body or my little one. Erbaviva's Buzz Spray (cutest name ever, by the way) is made with catnip which naturally repels bugs. It sprays with a fine mist and I can't feel it once it dries. It has a citrus/herbal scent that is much more appealing than typical bug sprays. This non-sticky formula is great for mom, dad and baby too. One safe and effective product for the whole family! *Disclaimer - These products were sent to The Beauty Puff for review.